Just in case it may have escaped your notice, I'm very partial to shades of blue. Some people may associate this color with sadness as in "I've got the blues." I however find it both calming and restorative. 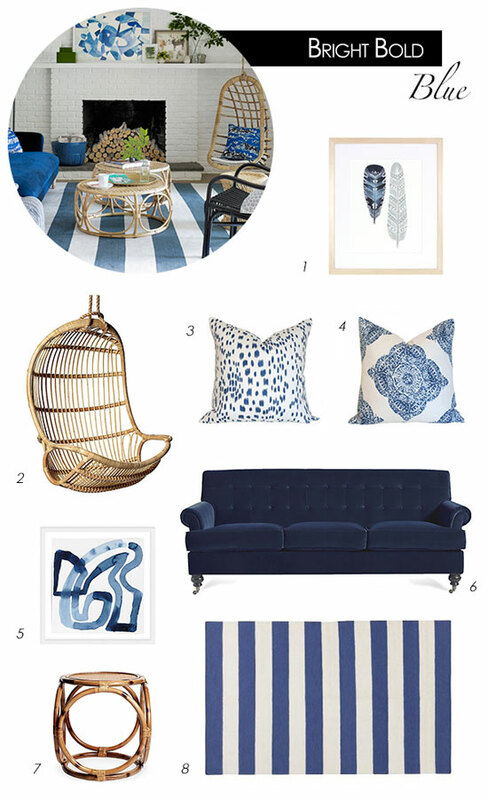 I seem to share this love of blue with interior designer and stylist, Emily Henderson. Everything I've seen from her lately in the glossies and on her blog I instantly love. This week's inspired design comes from her recent appearance in Country Living with her take on a family friendly retreat in Upstate New York. I'm more than a little obsessed with that rattan swing. It reminds me of the one on my childhood best friend's porch. And its early 90s floral cushion. Comfortable, yes - chic, no. Skip the cushion and throw a sheepskin on it to keep from walking around with those oh so attractive red impressions on the backs of your legs. Oh my gosh I love this whole look. Just my style! Blue and white is my all time favorite color combo and I love that mixed with the natural rattan. Once I have an apartment that can actually fit a couch, I'm absolutely getting a navy couch with a variety of blue-patterned pillows. I love that pillow in #4!